You remember the first ever Holga camera I’ve bought? The 120SF (plastic lens, no tripod mount, no bulb switch, no colour flash)? Well guess what: I’ve taken a screwdriver, some superglue, a drill bit and increased the aperture by two or three stops using this very detailed article by Mark Hahn. By default, all Holgas only have one aperture – despite the switch. The switch only puts an arm with a hole in front of the “default” aperture of around f10 (give or take half a stop). I guess the plan at Tokina (makers of Holga) was to put a different aperture bit onto the arm. 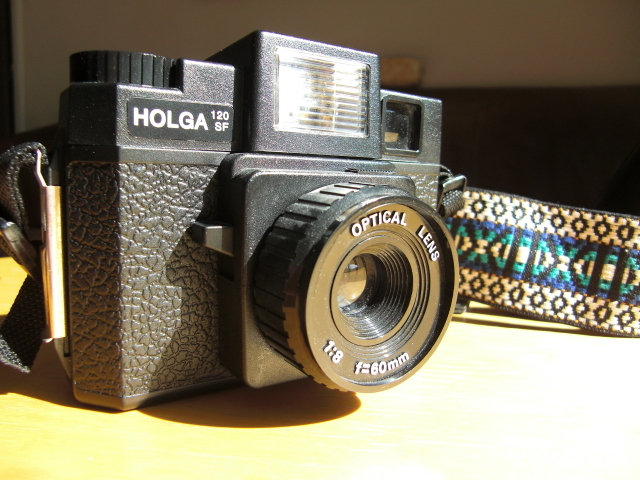 Ever since Holga went into production, they er… “forgot”. Never mind, we can do this ourselves with only 30mins of work and get a lifetime of enjoyment out of it. f10 isn’t huge, and I always wanted something bigger like f5.6 or even f4. It won’t be enough for indoor shots without flash, but it WILL be enough for outdoor shots even when the sun is hiding. So far, I’ve only modified one camera to see if it works, and I’ve just developed two rolls of fresh Velvia. The film is still wet as I type, but I have to say it looks rather great to the naked eye. Scans coming soon! Next week, my plan is to make a video of how to modify them – so stay tuned for another Pinkstone Pictures production.